So what's been happening in Geraldine since I landed on Tuesday night? Lots and lots. This town reminds me of Todmorden in a way. It has an amazing sense of community. More clubs with people sharing their passions than you could possibly imagine. Really fertile ground for what the Incredibles are doing. But interestingly, what make Incredible Edible something other than a club came out in a meeting last night when a local lady asked a perfectly reasonable question. With all the clubs there were around isn't what we need not another club, but something that knits them all together? I paraphrase but you get the idea. And the response from another lady at the same end of the room? But Incredible Edible isn't a club. It's a philosophy. It's a way of life. Yes, it most certainly is !! The public meeting on Wednesday night was a great occasion. The sports hall in a local school was full, more than two hundred people, some of whom had travelled fifty kilometres or more. As always, I just tell our story with loads of pictures of Todmorden, but also the fantastic stuff happening in London, Bristol, Salford and other UK Incredibles. This time I also got to include the propaganda gardens in Geraldine which will now be a permanent feature of our story. They were fantastic. Supportive, enthusiastic, totally getting why we do what we do. After questions, the room was buzzing with folks talking to each other. Taking ideas back to their communities, sharing the stuff they themselves were doing. What a lovely bunch of people. Before that I had done a lunchtime session with local council officers and politicians, where in truth some were supportive, suggesting edibles could just as easily be maintained in council beds as the flowers that were already there, and others had a way to go. But that's the way it rolls. Not everyone gets on board straight away. What's really exciting is the local Geraldine councillor, who also came to the public meeting was great so here's hoping for a wonderful partnership on the ground . Yesterday spoke to primary school teachers in the afternoon, already doing loads of stuff despite the pressures of the job. We threw around ideas, including planting edibles, outside and along the school fences, creating edible walls and walkways and families bringing excess produce into school to be taken home or swapped by other families. The community is already working with one school on a vine route, where vines are twisting their way along the school fence creating an edible bridge to the world outside the gate. Evening was a meeting in a great cafe called The Running Duck which has its own raised beds mixed in with its outside tables. This was a call to action for volunteers to help with spreading Incredible Edible in the town and again folks offered up their time to manage the website, help with maintenance and all the other stuff needed from posters to baby sitting . Had a chat with two fantastic local business women who have supported what's happening from the beginning. As Totally Locally is already here in Geraldine, why not Totally Incredible, the first in the world? Why not? Loads of press interest to spread the word, loads of ideas taking route. Sad to leave but its Friday so it must be Christchurch. Exciting if a bit scary. A call to action for volunteers to help with spreading Incredible Edible. 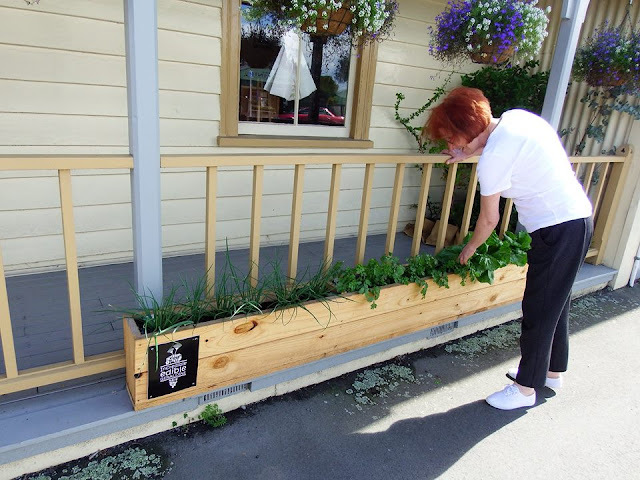 Held at the Running Duck Cafe - Geraldine where they have a host of edible planter boxes outside the cafe growing for everyone to share.